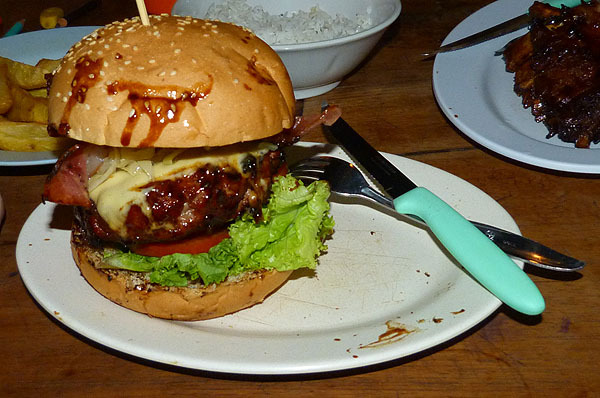 Naughty Nuri’s is a long-term favourite hangout for anyone in the know in Ubud. It is the place to go for BBQ meat. 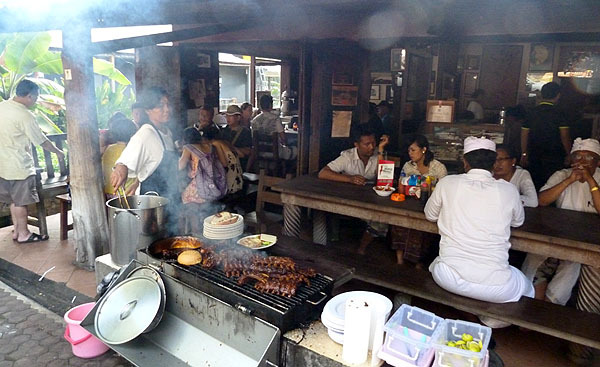 If you drive past you will always see a crowded restaurant with smoke billowing from the barbecue out front. 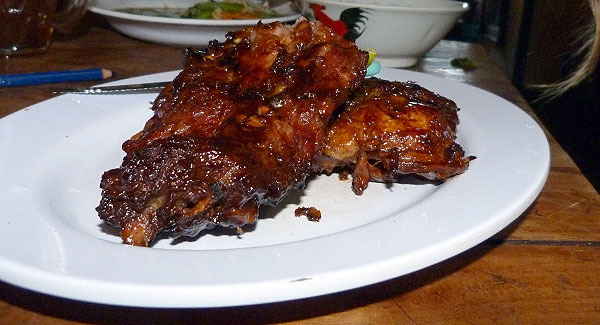 The go to meal here is the pork ribs. They have a bucket out the front which they pull them from and slap them on the grill. There are no fancy servings here, just a pile of meat on a plate. 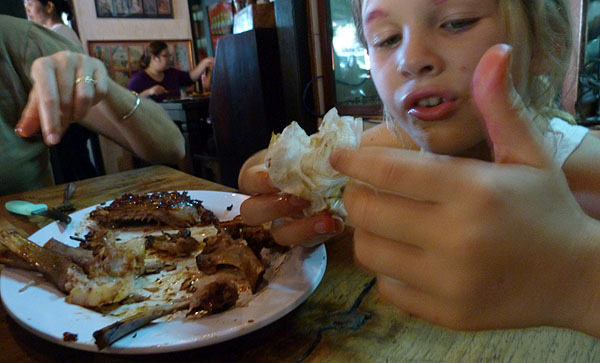 Clare needed some veggies, so tried an Indonesian dish which was not to her liking. 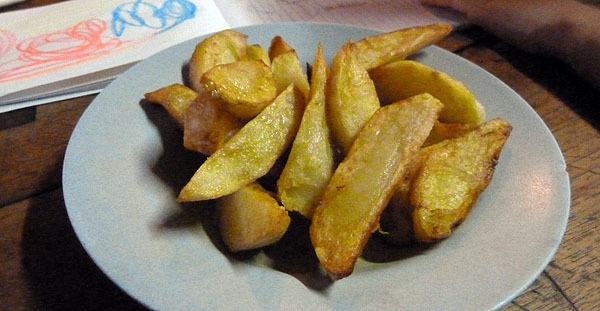 The potato wedges were the best we have had in Bali. The burgers are also poplar here, and once you see them you will know why. Rob was just able to get his mouth around it. 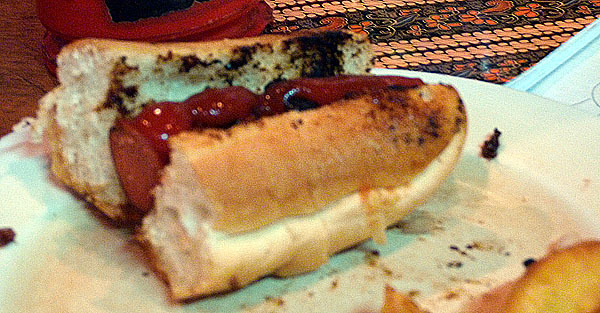 There was a nicely cooked hot dog for the kids, but don’t expect any extras. Just a sausage in a bun. The smoke from the BBQ can be a problem. We were seated towards the back and away from the barbie, no smoke but was hot and stuffy. You will need a drink, and the beer is apparently served very cold which is what you will need. We were not in the mood for a beer, and a large Bintang was Bali expensive at 44,000 rp ++, so we gave it a miss. 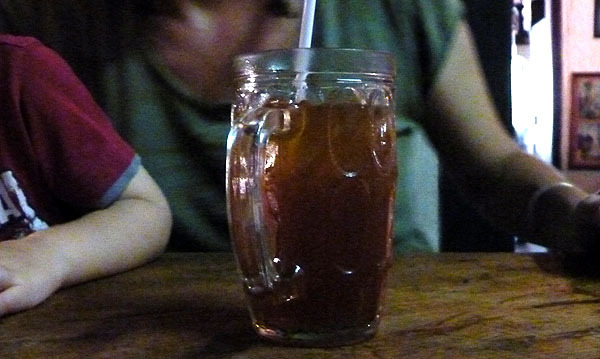 Clare had an ice tea which was very sweet. The prices are a bit high for what it was, nothing fancy, service without a smile, but the serve sizes were big, and the food tasty. You have to try it at least once. Olive ate up her dinner, which means it must have been good. 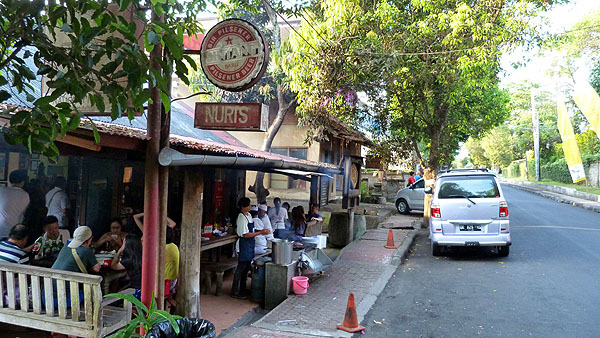 There is a copycat restaurant located a few door up, called Nuris, make sure you go to the right one.